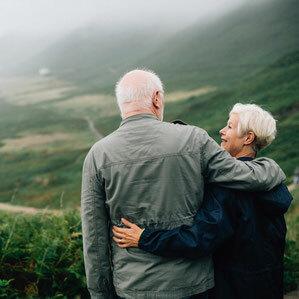 According to Harvard's Joint Center for Housing Studies, "More than half of the nation’s households are now headed by someone at least 50 years of age." There are numerous ways you can plan for your future, and a bathroom remodel that considers your future needs is high on the list. Don't let your future health and well-being suffer as a result of a lackluster bathroom remodel. 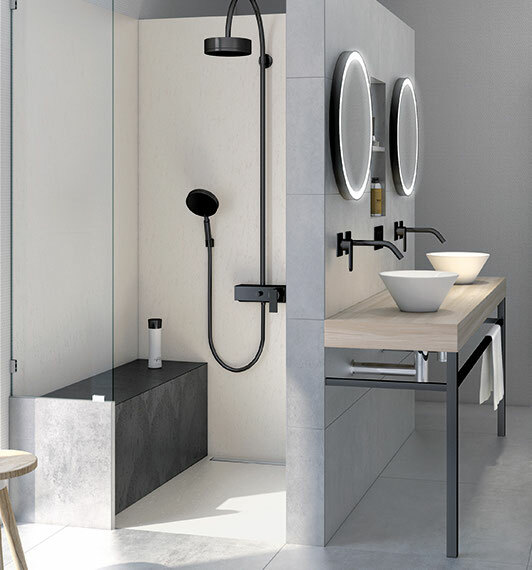 Here are some things to consider when designing your new bathroom. 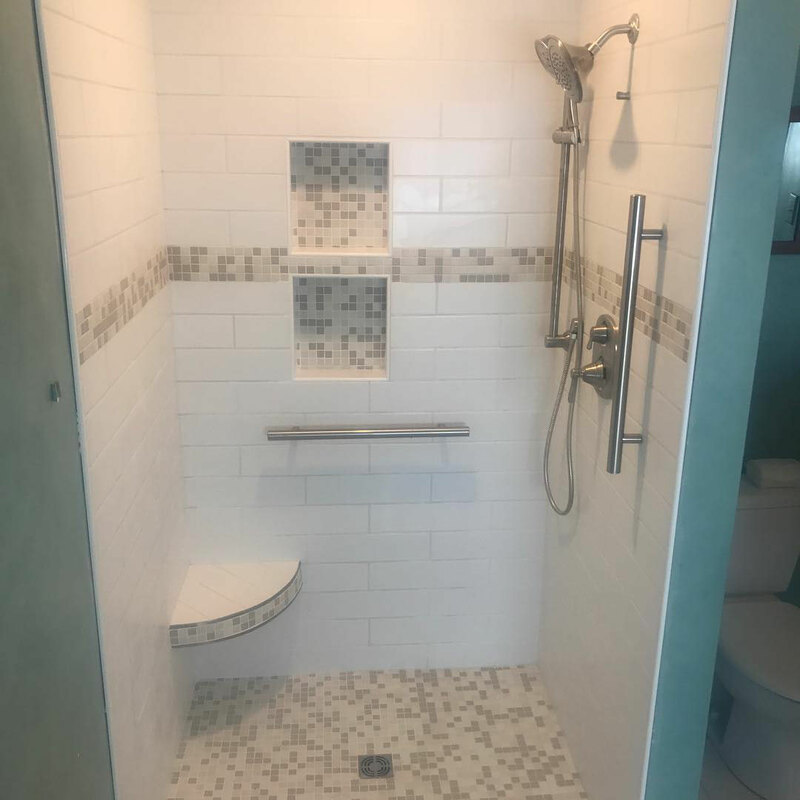 We work with three build-a-shower systems that offer tileable curbless shower pans that are pre-sloped for water drainage. 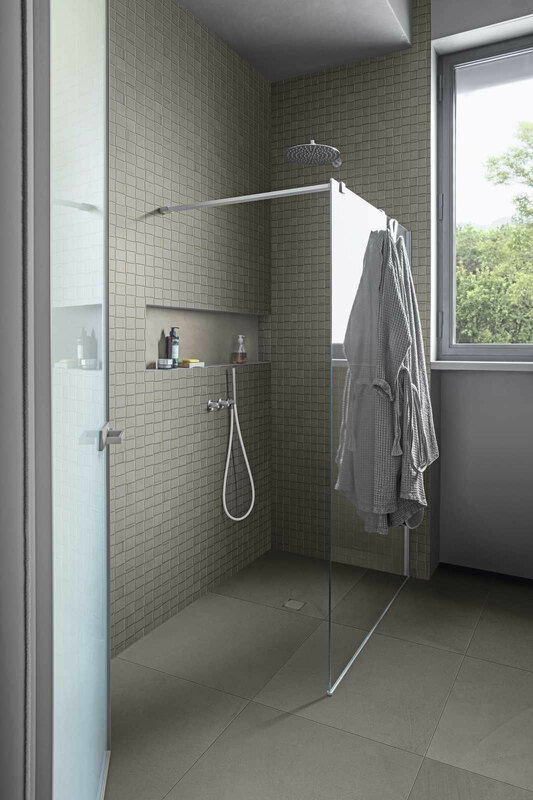 Schedule a free in-store consultation, bring your room measurements, and we'll help you choose the right shower system for your space. Join us for Wet & Wild Wedi Days, now through April 30, 2019. We're taking 10% off all Wedi products and offering FREE Wedi installation classes every Saturday in March and April. Put grab bars everywhere! By the toilet, in the shower, or wherever you may need a little extra support and safety. We sell TileWare's ADA-approved grab bars in our online store. Have a seat, get off your feet, and relax a moment with a shower bench. These can be custom built to any size and, depending on installation, can support well over 600 lbs of weight. 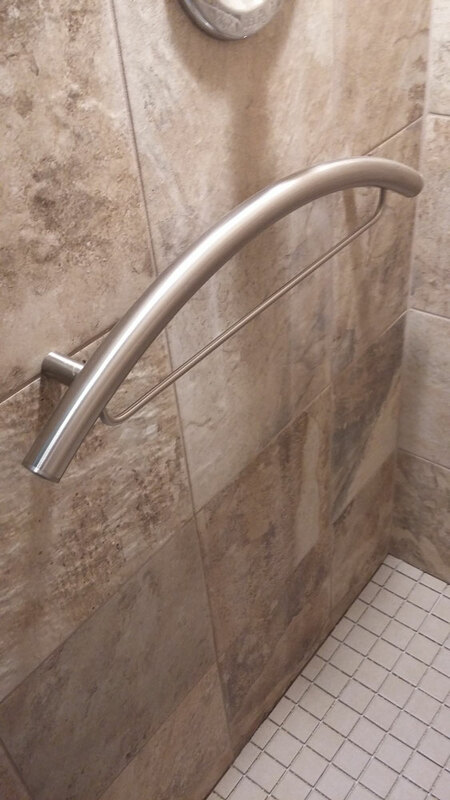 NOTE: If you install a bench, a grab bar is recommended for help standing up and sitting down. 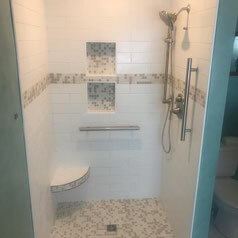 BONUS: If you install in-floor heating, you can carry it into your shower pan and onto your shower bench for a heated seat. It's okay, our heat system is waterproof. 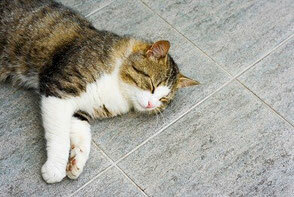 If you have pets, they'll love a heated floor. 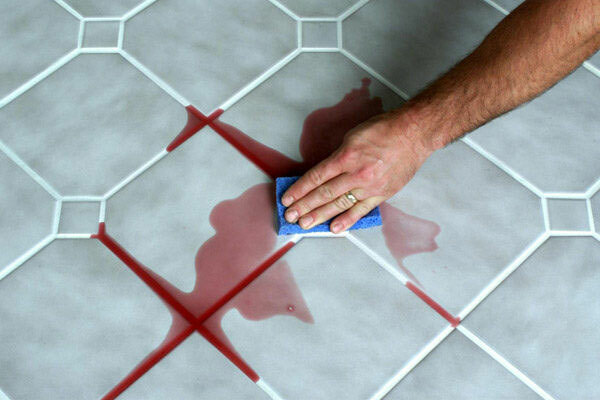 Tile is great for cleaning up pet hair and any little messes they make. It's sad to say that some people have passed away after falling in the bathroom, not because of injuries sustained during the fall, but because they were unable to get up and succumb to hypothermia on cold floors. We carry Schluter's Ditra Heat system, which can be easily waterproofed and customized to your space. Use it to heat your floor, your shower pan, and your shower bench for endless comfort. 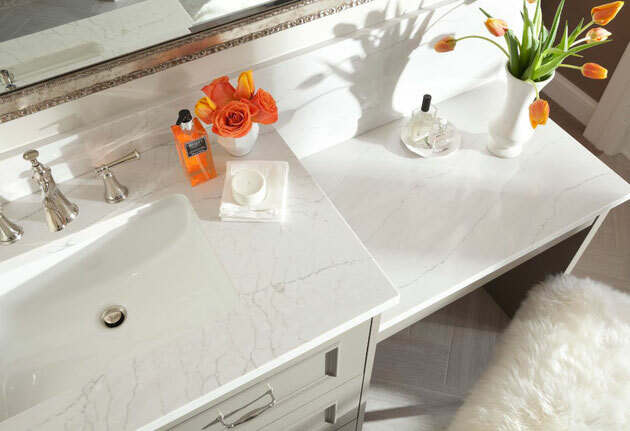 Cambria Ella is a lovely quartz countertop material that looks like white marble, but isn't victim to white marble's biggest problems: staining, scratching, or chemical damage. 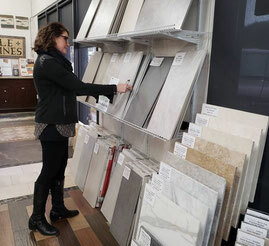 Quartz countertops have surpassed granite as America's favorite countertop material. These dense, gorgeous, man-made slabs come in hundreds of designs and colors. This bathroom features porcelain tile countertops, floors, and shower walls. Porcelain tiles are great for floors, showers, and even a low-cost alternative to slab countertops! If you're remodeling your house to put it on the market, then you should consider contemporary tastes and what a potential home-buyer might like. However, if you don't plan to leave your house for 10+ years, then this project is for you, not for others. The point of aging in place is creating space for your future. Get what makes you happy! Do you love purple? Get purple tiles. Do you dream of decadent gold? Get gold tiles. Want a heavenly all-white design? Get white tiles. Do you love color, lots of color? Get colorful tiles. Always keep in mind that this design is for you, so make your choices based on what you want and need, not what the design magazines tell you to get. Our designers have installation experience and can help you through the entire design process. 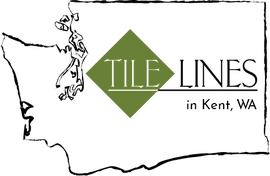 Call us at 253-872-0449 or email info@tilelines.com to schedule a complimentary design appointment with the Tile Lines team.